Posted on January 26, 2019 at 7:44 pm. I’m still on a bit of a high this evening, having finished a particularly challenging run this morning in really, really cold weather. Did I mention it was on snowshoes? And the temps hovered just above zero? When I ran my very first Big Foot 5K and 10K Snowshoe Race about six years ago, I remember wondering what I had gotten myself into. A newer friend, who has since become one of my closest and dearest friends, inspired me to give it a go. It was tough—and I was hooked. I’m a trail runner at heart, so logging miles in the woods? No-brainer. Hills? On my best days, I embrace them, and on my not-so-great days, I remind myself of the mental and physical strength I am building by pushing myself to go beyond flat terrain. But add snow (lots of it), single-track trails, and snowshoes? This was a game-changer. And yet, that was just it: it was a game-changer. In the very best way. It got me outside of my comfort zone—something we all know can lead to really great, wonderful, and scary-awesome things. I crossed that finish line and felt like such a badass. It was another athletic accomplishment that left me thinking, well, I did another thing I didn’t imagine I’d ever do. And: what else could I do, having just done this? I love how taking on new challenges and pushing ourselves in new ways can have that effect. Flash forward to today’s race. While I haven’t run it every year since that first one in 2013, I have done it a handful of times. A couple of Januarys I ran the 10K, as I did today. Other years, the 5K, with Joe and with family and friends. This year, I decided on the 10K. I knew it would be hard (6.2 miles on a hilly, snowy trail is what it is) and I think that’s what I’m after these days. Going after hard. Seeing what I am made of. It’s not easy and it’s humbling. My body is definitely changing as I reach my mid-40s. But I also refuse to accept the best days are behind me, athletically speaking. Who says? Well, me, sometimes. But really, that’s just negative self-talk. I think if anything, going after it at this stage of my life simply requires a shift in mindset. A swivel in a different direction of what we each individually define as our success. Here’s how today’s race played out. 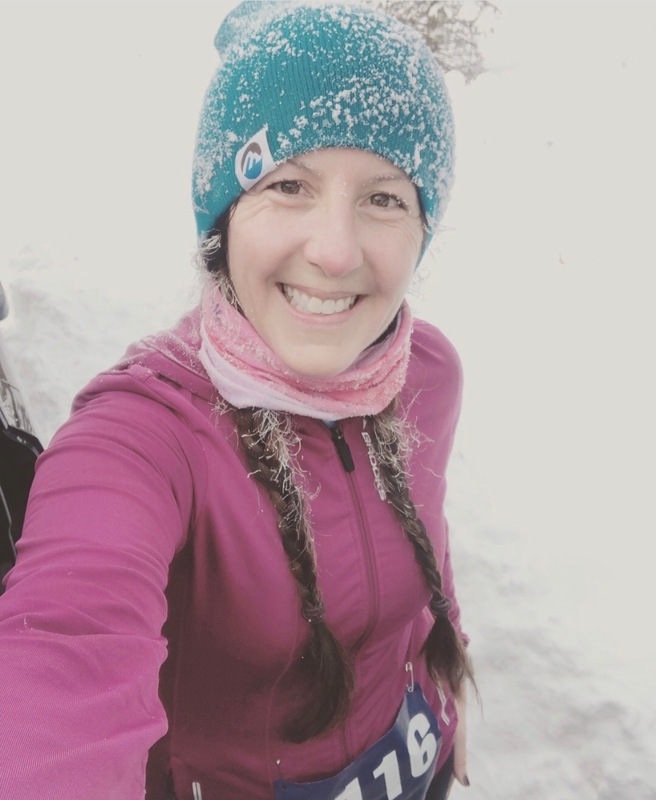 And I just want to add this, in case you’re wondering about running in snowshoes and what it’s really like: you CAN DO THIS. And, listen: it’s really a ton of fun and so satisfying. If you haven’t already, please take a listen to this episode of the MRG podcast about snowshoe running and its beauty and benefits. And then let me know what you think and if it inspired you to get out there. I think it will. The moment I saw my friend Cassy at the end of the first loop. That’s a wave and an “I love you!” from me as I went by, feeling grateful for her constant support of my adventures. Not going to lie, snowshoe racing is tough. Especially when it’s 1-degree at the race start. And there’s the single-track hills meandering through the woods—talk about quad and lung burn. I did think maybe, just maybe, the 5K would be a better option on this day. Even though I did sign on for the 10K. My legs, feeling heavy throughout the first loop, would have been just fine going with a shorter distance. But as I pushed through the final climb of the first 5K loop and made it to the straightaway that led to the crossroads of 5K’ers heading to the finish chute and 10K’ers continuing on for a second loop, I knew I could keep going. Just keep moving. Power on. Getting a high five and cheers from great friends right there helped so much, too. Spectators: never underestimate your impact! Running is so mental. 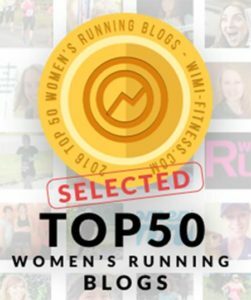 I had moments of negative self-talk (“You’re older now, you maybe aren’t as strong at snowshoe racing as you used to be”), but I quickly pushed those thoughts aside and did my best to replace them with something else. Keep it steady. I am strong. Up and over. Run your own race—today’s race. I GET to do this. I found a groove, and I am telling you, that is the very best feeling. It didn’t mean it got easier. It was hard, all the way through. But I felt confident. Maybe swimming is helping with this, too. 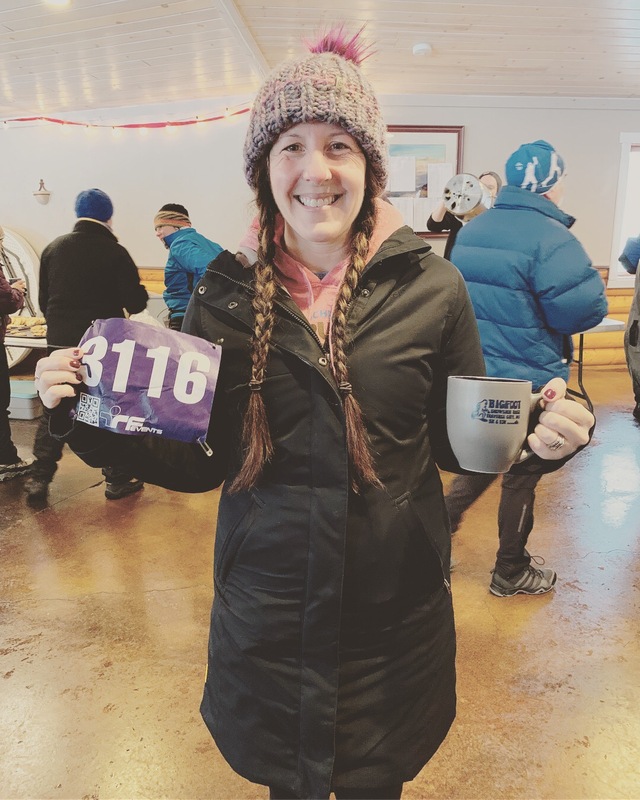 If I can go so far outside of my comfort zone and try to become a swimmer at age 44, then I can absolutely run 6.2 miles on a hilly snowshoe race course. I’ve done this before, and I can do this again. I also reminded myself to look up, not always down, and see the blanketed trees sparkle in the sun. The fresh powder made for more challenging sections of the course, but was it ever gorgeous out there this morning. Icing on the cake: hugs and conversation with dear friends. And a 4th place age-group win — loving my new mug! It’s a great Saturday. 4th in my age group! Cassy and me. She was there with her family; her husband Jeb won the 10K and her son Isaac took third overall in the 5K. Tell me: what is your mindset these days? I know we’re all at different stages. I’d love to hear where you’re at—are you going after it? Taking a breather? Restless as you think about what you may want to tackle next? 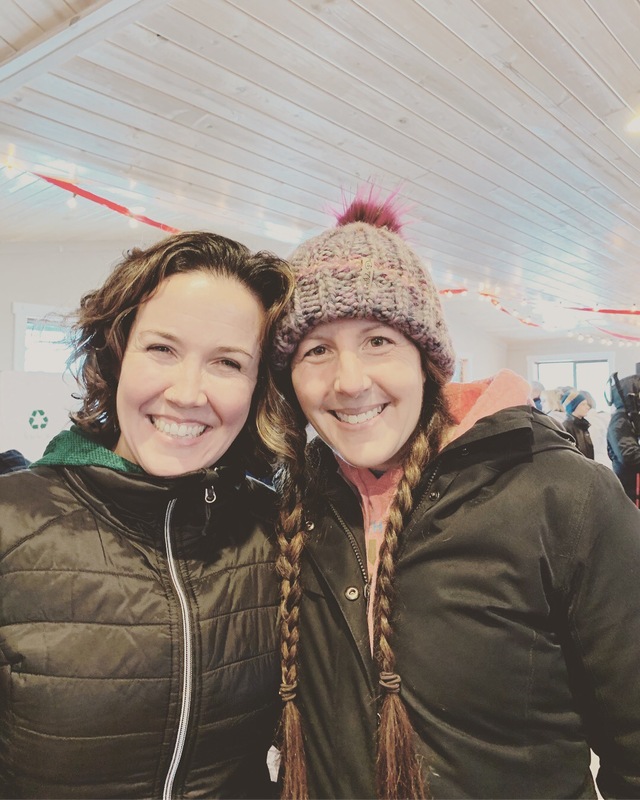 Ready to try a snowshoe race? 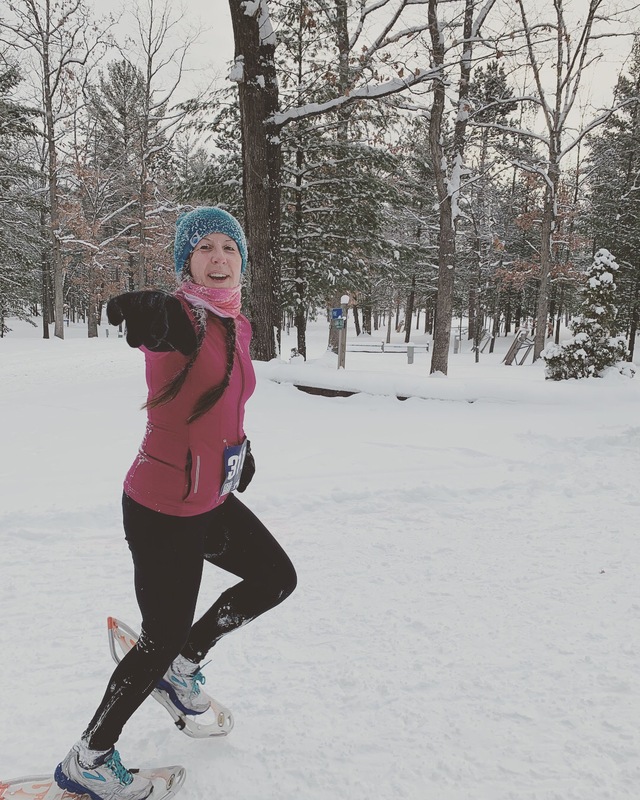 Here’s one coming up that I suggest trying—it’s one of my absolute favorites and the race organizers, Great Lakes Endurance, are so wonderful to their runners—the Tahquamenon 5K and 10K Snowshoe on Feb. 16th at Tahquamenon Falls State Park in the U.P.